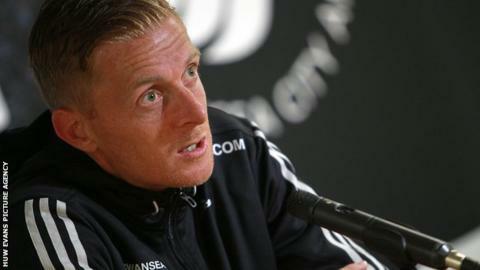 Swansea City boss Garry Monk says he wants to make "one or two" more signings before the transfer window closes. The 1-0 win over Burnley on Saturday was Swansea's second victory of the Premier League season. After signing defender Federico Fernandez and midfielder Tom Carroll, Monk wants to make further additions. "It's vitally important in this league that you have strength in depth," he said. "I'd just like one or two more to make sure it's absolutely sealed in going into the season with a full team. "If you look really look at it, if we have two or three injuries you start to become thin on the ground so one or two more would be ideal for us." The transfer window closes at 23:00 BST on Monday, 1 September. Argentina international Fernandez has signed from Italian side Napoli on a four-year contract while Tottenham midfielder Carroll has joined on a season-long loan. The Swans are close to tying up a deal for striker Modou Barrow from Swedish side Osterunds but he is seen as a player for the development squad rather than the first team. Monk has already recruited Lukasz Fabianski, Bafetimbi Gomis, Stephen Kingsley, Marvin Emnes and Jefferson Montero during the summer. Midfielder Gylfi Sigurdsson joined from Tottenham Hotspur with Wales defender Ben Davies moving in the opposite direction. South Korea midfielder Ki Sung-yueng also returned to the Liberty Stadium during the summer following a season-long loan at Sunderland. The 25-year-old's current deal expires at the end of the season but the former Celtic player said he is ready to extend his contract with Swansea. "I expect to extend my contract," Ki said. "I'm very pleased with everyone, the squad and also the staff. The way we play football is suitable."